This innovative Wrapmaster Duo dispenser unit may be loaded with any combination of compatible foils, baking parchments or cling film. Capable of loading either a combination of two different products or two of the same product (for high volume use), this dispenser will help save 40% of bench space which is usually taken up by the use of two units simultaneously. Can be wall-mounted or left freestanding if you prefer. The unit benefits from Wrapmasters "push to cut" safety blade, providing a clean, tangle free cut every time, helping to save up to 35% on waste when compared with not using a dispenser. 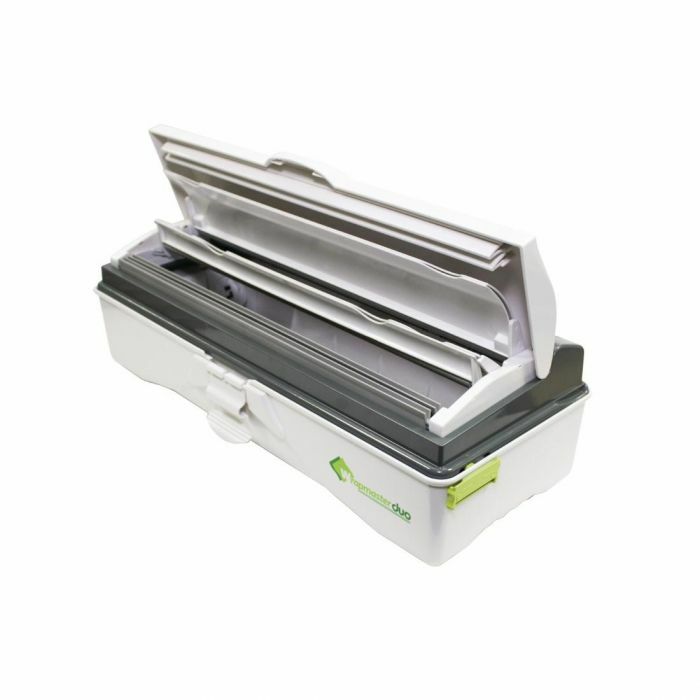 Featuring removable non-slip feet and a lockable lid, this dispenser can be stored away neatly and cleaned by hand or machine up to 90°C (194°F). Please note that only Wrapmaster refills will fit this dispenser. Refills available in cling film, foil, baking parchment, greaseproof paper, roasting film, nonstick foil and foil lined parchment. Wrap Film Systems is an award-winning market leader in supplying both branded and private label cling film and aluminium foil products. Supplying to the catering, hospitality and retail sectors, Wrapfilm are the company behind the catering brands such as Wrapmaster and Caterwrap, as well as the prestigious household brand Bacofoil. Exporting across the globe, their product design experts have a wealth of international experience in the catering and hospitality sector.